Bonner-Prendergast's Maeve McCann leaves the game late in the fourth quarter after fouling out against Bethlehem Catholic in the PIAA Class 4A Girls semifinal at Souderton High School March 19, 2019. Bonner-Prendergast lost, 64-50. Maeve McCann knew it was over. Not only the game, but her high school basketball career at Bonner-Prendergast. With less than a minute left in the contest, McCann, a Jefferson recruit, fouled out and cried on coach Tom Stewart’s shoulder as the Bonner-Prendergast girls’ basketball squad lost, 64-50, to Bethlehem Catholic in the semifinals of the PIAA Class 4A playoffs at Souderton High on Tuesday. Up until she fouled out, McCann dove for nearly every loose ball on the floor and made key plays for the Pandas. She finished with 15 points, including 11 in the second half. But one thing McCann and the Pandas didn’t have an answer for was Golden Hawks junior guard Jaleesa Lanier. From the start of the game, Lanier was hot. She helped the Golden Hawks pull away in the second half as Bonner-Prendergast took the lead. With Bethlehem Catholic and the Pandas tied, 37-37, in the fourth quarter, Lanier drained a trey to give the Golden Hawks the lead. After that trey, Bethlehem Catholic never surrendered the lead again. Lanier scored 26 points and recorded four three-pointers. Pandas junior guard Dakota McCaughan scored eight points, and sophomore forward Alexis Gleason had seven. 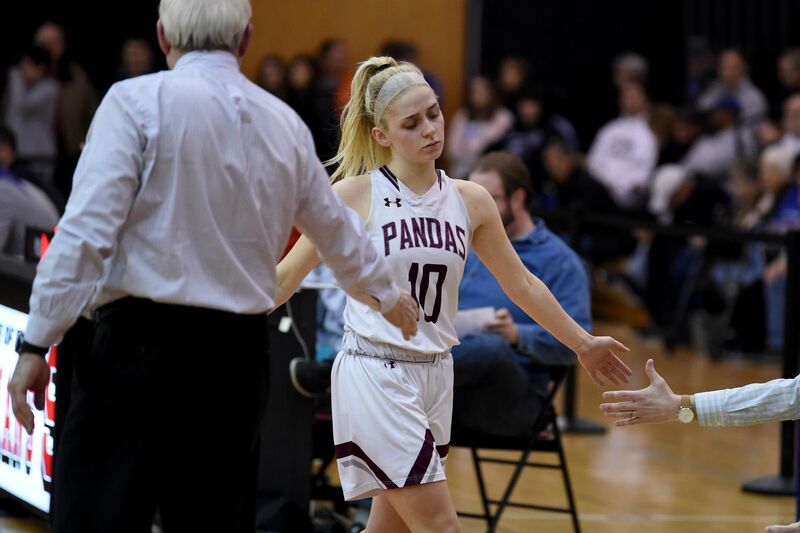 The Pandas battled back from an eight-point deficit in the second quarter, but their shots didn’t continue to fall, as they had in their previous wins in the state tourney against Bishop McDevitt-Harrisburg, Lake Lehman, and Bermudian Springs.